Mecca Bingo has an easy to use website and thousands of players. A must visit for all you bingo and game lovers. •You’ll then be able to play with £30 online and get £10 to use in any of our clubs. With all these fantastic goodies, why wait? Sign up and discover that welcoming feeling at Mecca. *If you’ve already claimed our Club Player Exclusive Bonus, you won’t be able to claim the £10 to use in club with this promotion. Don’t worry though – you can still enjoy the rest of the bonus (£30). Instead of collecting your winnings or depositing online, why not do it in your local club? If you’re cashing out you can make 1 withdrawal a day that’s between £10 and £100 from any Mecca club. You just need to call 0800 032 0500 FREE between 10.30am and 9pm to make an arrangement to pick up your winnings. • After every bingo game, the winning wheel will spin. Qualifying players who had 6+ tickets in the game will win a share of the pot of up to £50 when the wheel comes to a stop. Mecca Bingo is one of the biggest and best bingo hall operators in the Country. The colourful graphics, easy to use website and 24 hour a day online games make it a must visit for all bingo and game lovers. 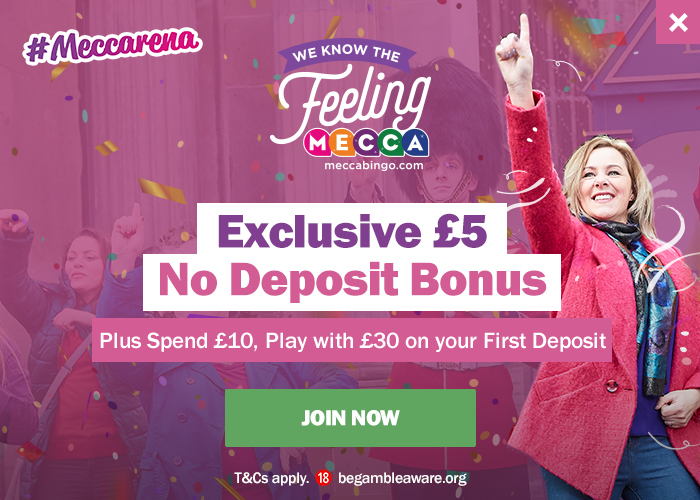 Mecca have some excellent promotions, they run a newbie room where all new players can play for free for 7 days after signup. Plus With Bingo Linx, there are huge daily jackpots up for grabs, with a massive £6,000 on offer at 10.30pm every Friday! love to play @ mecca when they have the daily jackpots on, grt fun!! Been playing at Mecca for 3 months now, love the Free bingo room and the large jackpots each evening... fingers crossed tonight!!! Excellent Bingo Hall - Great welcome Bonus, Great Games and friendly people to chat to all day long. love 2 play mecca bingo. loving it. I like the site, havent won there yet but everyone seems very friendly on there. Ive been a member of Mecca bingo for ages and ages. I love the fact that you only need a small deposit. Britains got talent bingo is great, nearly as good as the show, had a nice little earner yesterday as well. Love playing at Mecca had Free Bingo in Jan as a new player, now making most of my freebie. Love Mecca Bingo, missed out on the offer. Cant say i liked this site much at all, hadnt any luck here so i do not think i will be returning. Used to have free money when you joined but dont now but you get a great deposit bonus!! Free Bingo room is great, ill be joining today make the most of the Free Prizes. Keep up the good work bingo offer!